If you’re an online retailer, you can’t afford to underestimate the importance of Cyber Week. Last year, a third of the entire season’s revenue was generated during the week following Black Friday, and kicking off on Cyber Monday. Preparing for such a major shopping period – to effectively maximise sales, without degrading customer experience – can be incredibly nerve-racking. There’s just so much to consider. That’s why we’ve put together this checklist. 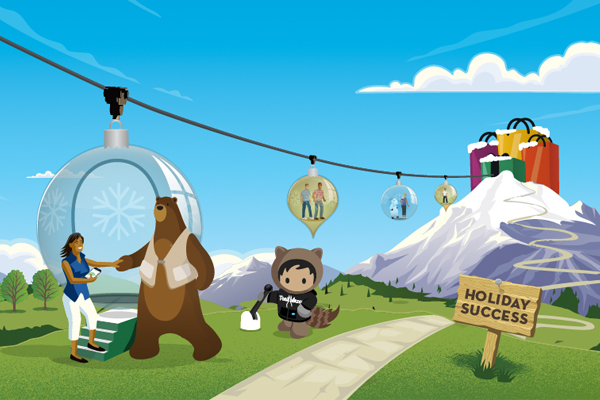 As Cyber Week approaches, let it be your guide to driving frictionless shopping and truly fantastic sales. 1. Create co-ordinating product sets. If someone’s looking at a pair of mittens, make sure they’re also seeing the perfect scarf and hat to complete their winter look; being able to add multiple items to a shopping cart from the same page isn’t just great for the shopper – it also increases average order value. Once you’ve crafted your product sets, shout about them. Use content slots and top-level categories on your site, as well as your most powerful social media platforms. 2. Get some extra help from AI. With so many online retailers pinging out Cyber Week promotions and discounts, it needs to be super-easy for customers to find the exact product they want on your site. · What did people search for last Cyber Week? · Have you optimised results for these terms? · What new product you do have this year? That means adding common misspellings to your dictionaries and featuring your product sets and/or big promotions on ‘no results’ pages. Watch out for terms that are displaying results, but not leading to conversions – it’s a strong indicator the wrong items are being returned. Analyse the SEO and SEM keywords that drove last year’s Cyber Week sales. With voice-related searches on the rise, you’ll also want to create targeted content that includes your highest value question-based queries. Finally, review your 404 errors in Webmaster tools, and check your site speed. When your peerless ecommerce marketing comms bring people to your product pages, you need their shopping experience to be as frictionless as possible. Map out your email strategy, paying careful attention to segmentation and frequency, and to the fact more marketing messages are opened on mobile devices – you’ll want to shout about your most compelling offers in those subject lines. Once you’ve planned your comms strategy, don’t keep it to yourself. Your support team need to know about your ecommerce marketing strategy, so they know when traffic is likely to peak, and which products people are likely to be reaching out about. 7. Experiment with different types of promotion. Tiered promotions – like “buy more, save more” or free-shipping thresholds – can help drive average order value. “Gift with purchase” promotions, meanwhile, are some of the most successful and highest converting a retailer can offer during the holiday season. Remember to make sure your promotions communicate urgency, and capitalise on that fear of missing out – as Cyber Week draws to a close, an “Offer ending tonight!” style message can really drive those last minute sales. 8. Be all over social media. Have you developed an influencer programme? Now’s a good time to start finding the people who can connect you with new audiences and help spread the word about key products and promotions. You’ll also want to launch a Cyber Week hashtag – or even better, a catch-all hashtag for the whole holiday session, to keep the social conversation around your brand focused on into December. If you’re using Salesforce Commerce Cloud , it’s easy to integrate Facebook dynamic ads and Instagram shopping to push products through these key social channels, and drive conversion. Get it set up. 9. Prepare everyone for what’s to come. As noted above, your customer service teams need to be ready for Cyber Week too. 10. Make every single day count. Cyber Week isn’t a single big ecommerce opportunity. It’s at least seven, stacked back to back. So, offer a new deal or promotion each day to drive repeat visits to your ecommerce website. (You’ll want to schedule content slots in advance, so your team isn’t burdened with manually swapping these day-by-day). Creating a contingency plan is also a smart move. If, three days into Cyber Week, your promotions aren’t performing as hoped, you’ll be glad to have a ready-made strategy for remedying the situation and getting back on track towards record-breaking sales performance. …then keep your momentum throughout the holiday season. For most UK retailers, Cyber Week is just the start – kicking off the busiest time of the year. The truth is, your ecommerce site and customer communications need to keep firing on all cylinders well into the new year. That’s why we’ve created a comprehensive Holiday Readiness Guide. Read it now for expert help smashing your sales targets throughout the holiday season.